Is he a potter who plays the banjo? Or a musician who plays with clay? Whichever pursuit happens to be paying the bills, Satake can take comfort in his accomplishments. Now, 10 years into his pottery career, his work is shown in galleries ranging from Blue Spiral 1 and Curve Studios in Asheville to the elite Cavin-Morris Gallery in New York City. And as a master of the Japanese banjo, called a shamisen, he’s performed on stages small and large, including Carnegie Hall, and alongside banjo maestros Béla Fleck and Tony Trischka. These days, Satake shapes dishes, teapots, trays, and vases in a converted garage studio beneath his Swannanoa home, which is fronted by two kilns: one gas-fired and the other wood. 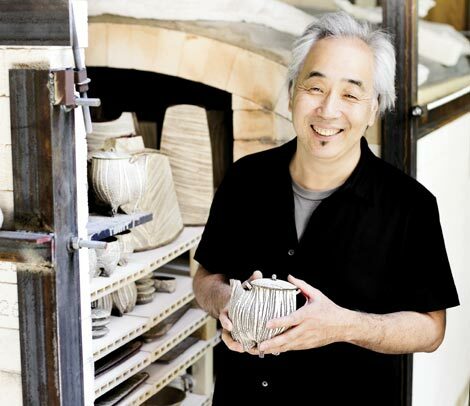 The choice of kiln is as important as his selection of clay to create pottery in methods that date back more than 500 years in his native Japan. He considers his work a collaboration between himself, the clay, and the fire. The result of that union exudes Satake’s regard for nature. In form and texture, his work displays the deep influence of the outdoors. His pieces mix uneven edges, rough textures, and soft finishes in subdued tones that can appear as delicate as a spider web or as sturdy as a tree trunk. He holds much passion for his music as well. When he schedules a rare concert appearance, he can depend on a sellout show. Satake plays primarily his own compositions, which display the same multirooted quality as his pottery. His sound combines an Appalachian base with overtones of Celtic, African, Middle Eastern, Bulgarian tempo and melodies. And beneath it all is the continuing influence of his Japanese roots. In distance and culture, it’s a long journey from Japan to WNC. In both his pottery and music, Satake makes it seem a lot shorter.